The Brooklyn Investor: Why BRK? Great post. It seems that BRK's stock picking hasn't really generated much alpha for quite a while already (emulating their 13F as a fund which only has 4 portfolio switching annually - an exercise I am trying to automate and eventually would like to cover as many 13Fs as possible to see if I can discover anything interesting). I think BRK would continue to outperform even if it only buys SPY in its equity portfolio. That's actually a question on this in the last annual meeting - Buffett thought a while and didn't say it was a dumb idea, but rather along the lines of wanting to preserve cash now. The BRK outperformance seems to be attributed by its solid and highly cash generative operating business, as well as the inherent leverage of the investment portfolio in its insurance segment. Whatever BRK bought on its 13F, or just bought SPY, seems do not affect the stock performance that much. Would you agree? It would be great if you could share with us your current thoughts on its valuation, as I would think BRK is now more fairly valued than cheap, yet they are buying back stocks at this level. Hi, 1.4x book seems really reasonable to me. I haven't really dug deeply into valuation lately. As for the alpha of the equity portfolio, that's a good point. I still think it is sort of cyclical (cyclically outperform, underperform etc... we are now in the down cycle, a long one). As for indexing it, that's also interesting. 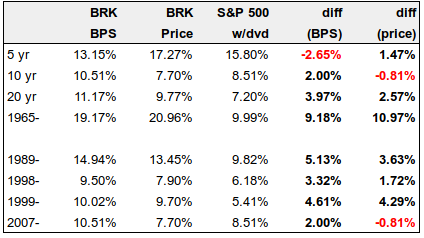 I guess even if BRK's stock portfolio outperforms, it's not going to be huge alpha... maybe 2-3% at most, which would add 1-1.5% to BPS growth over time assuming 50% of BRK BV in stocks. By the way, I've thought about creating a superinvestor return calculator too using the 13-F's. I think I've discussed that with someone here before, maybe it was you. How about creating a S&P 480 or something like that via negative stock selection, i.e. excluding the 20-50 stocks that Buffett/Combs/Weschler think of beeing a fraud, playing accounting tricks or are strongly overvalued. This should be doable and result in at least moderate outperformance. Hi KK, I think that was me talking about 13F. Yes it's quite painful if you work from the raw filings. My idea is to have a top-down approach and start from all the 13Fs filed to see if I can discover anything interesting (e.g. 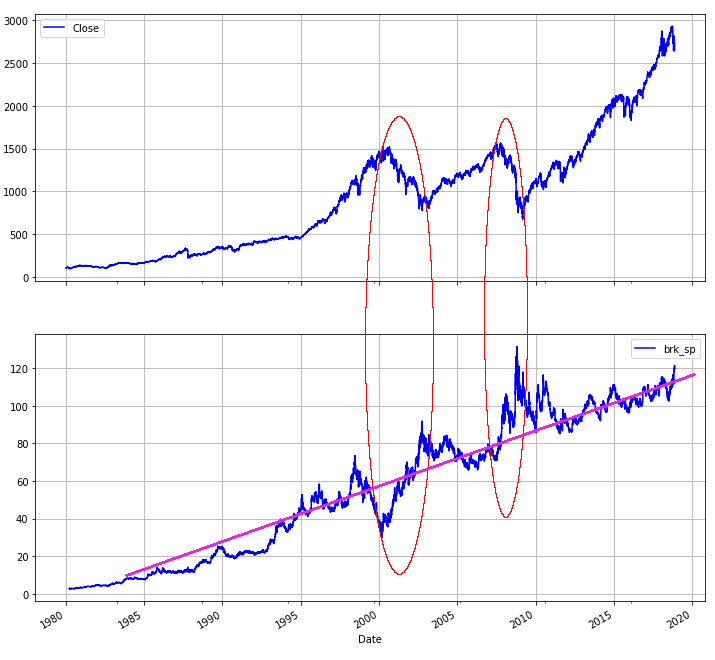 long-term alpha, low turnover, non-index hugging, not concentrated in only a few stocks). To discover future Todd & Ted. Whalewisdom is the solution but it is a paid service. As I have access to Bloomberg, I combined the free version of Whalewisdom with Bloomberg. I am sure there are other ways to do it. Whalewisdom has a list of all 13Fs where I can sort by return, AUM, no. of stocks and portfolio turnover. I ignore the return column as do not find them reliable, ususally I use Bloomberg to verify. But the full list is useful. I screen out the filings with too many stocks (like Vanguard?) or too few stocks where we value investors can study closely (perhaps 10-50 stocks per portfolio?). Screen out the ones that just filed 13Fs not long ago (at least 5 years of history?). Screen out the small funds (perhaps starting from $300mn?). Screen out the ones with too high turnover (with a 45-day delay quarterly filing, too high turnover makes it meaningless). Then you will be surprised the list will come down to a manageable number. Then I will individually look at these candidates on Bloomberg's PORT function, which you can see what stocks they buy or sell each quarter, with other features like volatility and drawdown. Bloomberg can turn that into an "index" for each 13F. This has become a leisure activity for me - sometimes you discover some interesting funds you haven't heard before, then you do a bit of digging and find that the CIO was ex-Tiger. Sometimes you discover this new mid-cap value stock you didn't know before (like DVA?). Semper Augustus put out an annual report, describing Buffett's brilliant pivot away from stocks in 1998 using the GenRe deal. Its argument is that Buffett knew KO was overvalued and didn't want to sell and trigger a tax liability, so he issued BRK stock and bought GenRe's cash and Tbill portfolio. And then used that portfolio to buy more businesses. Semper thinks that while the stock portfolio underperformed, Buffett was able to engineer a stock sale through this deal and use the proceeds to buy businesses that outperformed, and thus generating the 9-10% increases in book value despite the terrible stock returns. I really hope they announce a massive tender. Buffett even admitted recently it was a mistake to not be buying back shares over the yrs and linking IV to what he thought it was worth vs a number like 1.2x. I just don´t see how they can buy back any meaningful amount of stock except in a 2008 scenario in which case he probably would be busy buying other stuff and rightfully so. Putting say 75bn to work in a tender at 10-15% above current stock price will pay off handsomely in 5 yrs. I like apple and the other stuff he buys but I think brk is a better buy now. At 1.37x bv and assuming a 10% growth a fwd p/bv of 1.25x seems pretty cheap to me. This is a great analysis. Thank you. Your point about BRK outperforming by 1.5x the index over time is very significant. I would note that what this doesn't capture in the BPS growth is that since 1998, BRK has shifted from a strategy of primarily investing in marketable securities to a strategy of primarily acquiring wholly own businesses. Increases in the value of the wholly owned businesses do not show up in the BPS since they are are not marked up on the balance sheet as they increase in value. For example, BNSF was acquired for approx $32 billion in 2010. Using UNP as a proxy, it's now worth $100 Billion - so that is $68billion over 8 years which did not show up in the BPS gains - and that's on one acquisition alone. This doesn't include the increases in value of geico (also in the tens of billions) and many other growth businesses. 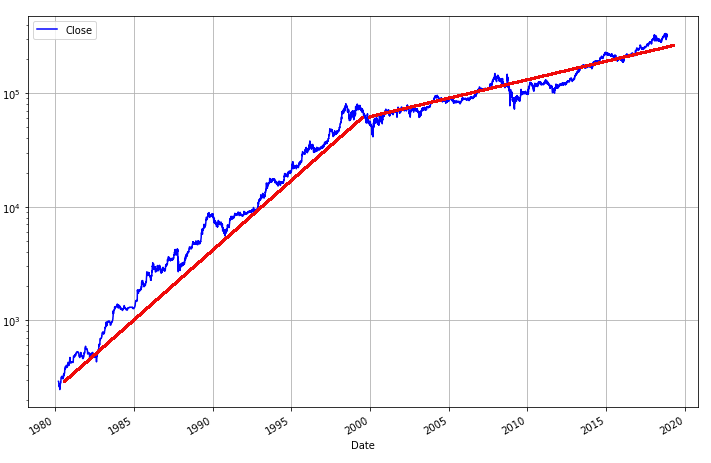 So if you include these, BRK would have outperformed by more than 1.5x the past 10 and 20 year periods. This, along with the recent buybacks, indicates the stock is significantly undervalued currently. Another way to see how recent BPS and share price performance does not indicate BRK's performance is simply to look at look-thru earnings growth. This is the method Buffett used to refer to often in his annual reports. Look thru earnings in 1999 were $1,050 per A share. As the stock was trading in a range of 50-80k during this period, the look-thru p/e was very high, as it was for most companies during what Buffett refers to as The Great Bubble. Given that BRK spent the past 20 years acquiring wholly owned businesses, and reinvesting nearly all capital into more of them and into equities - and given that taxes were cut from 35% to 21%, BRK look-thru earnings in 2018 are expected to be approx 23,000 per A share. This is astonishing. If you assume that the $100billion cash position is invested at even a 20x p/e - or used for buybacks -that would bring normalized look-thru earnings per share in 2018 to $26,000 per A share. This is a 25x increase in earnings power over 20 years, or approx a 17% annualized rate of gain. As the Sp500 grew by 6% since 1998, that's an 11% per year outperformance in earnings power - about what BRK has done since 1965. Astounding given that it's grown so much in size. It also means it's valuation has gone from a look-thru p/e of around 50 to a p/e of 13. It makes sense since the float leverage of 1.5x equity provides 3-5% per year outperformance, depending on what the sp500 does. Security selection and margin of safety another 3-5%, and perhaps another few percent from asset allocation. Also look at BRK's look thru earnings gains in comparison to the EARNINGS gains of the SP500 itself for he past 10 and 20 year periods. For the 10 year period, per share look thru earnings were approx $7,700 per A share in 2007, which indicates a rate of gain of 13% the past 10 years in earnings power of BRK. Meanwhile, the SP500 has grown at 8.5% since then, giving BRK an outperformance of 4.5% the past 10 years, even with the SP500 after a long bull run. If you look at SP500 earnings, the index earned 44/share in 1998, which grew to 124/share in 2017 -or a 5.4% rate. Compare this to BRK's 17% rate. In 2007, the SP500 earned 82/share, growing to 124/share in 2017 - or a 4.3% rate. BRK grew look-thru earnings at a 13% rate since 2007 - about a 9% outperformance over the past 10 years. Why would BRK stock sell at a p/e of 13? Using a 10% discount rate, this indicates the market is pricing in an earnings growth rate of 2% annually for the next 10 years. Assuming 10% earnings growth, the stock would need to be at a 22 p/e, or about 600k per A share. I'll note that the SP500 currently trades at a p/e of of about 22 times 2017 earnings (2650/124). Yet BRK outperforms the SP500 over all periods, so rationally deserves a premium, not a discount. He switched strategies in the late 90s, and the world has not caught on to the fact that he continues to increase the earnings power of his businesses at a rate 8-12% per year faster than the broad market. This amount of outperformance leads to miracles in price gains, as shown by the 10% per year advantage over the SP500 since 1965. "Why would BRK stock sell at a p/e of 13? Using a 10% discount rate, this indicates the market is pricing in an earnings growth rate of 2% annually for the next 10 years." Don't forget that Berkshire's earnings are growing faster than that because they retain all earnings. You can't discount each years earnings in your model *and* get the growth from retaining earnings, you are basically double counting. Interestingly and for comparison. WTM performed 2 dutch auction style buybacks recently for roughly (i believe) $2B and their shares still remain below book value. First question is how did this help WTM shareholders, and second question is why would it be different for BRK shareholders if they did same? As a WTM shareholder, i'm genuinely interested in responses. Good points jj. I do think Buffett shold have been buying back stock over the past 10 yrs. My main concern is there is no way they can meaningfully buyback stock. If they are buying back a lot now (I hope so) then when he next 13f comes out the price will adjust and then it will be impossible to buy back at a decent price. I think he has to do a major tender. I like apple but its future is less knowable than brk. Even the great Buffett may feel pressure to buy stuff if the money is burning a hole in his pocket. Also the only way to convince people to sell is to do a major tender of say 75bn when the mkt is under pressure like now not when things are going well. Here in this interview with Charlie Rose from 2007, Buffett states that 'the real goal at Berkshire is just keep building more and more earning power'. If you judge BRK on Look-thru earnings growth, the outperformance over the SP500 is still in the 9%-12% range over the past 10 and 20 year periods. This is simple fact is not recognized by the market, as it focuses on BPS growth. The result is that BRK now sells at a historically low P/E (13), while it's record of outperformance remains very high. I will also note that fears about size anchoring performance have not so far materialized in a meaningful way. Also, the SP500 has a Market Cap of $22 Trillion - and it still grows at 6-8% or whatever - so BRK, using safe leverage from float, buyback etc - and at just $500 Billion market cap - has a long way to go in outperforming the SP500. Charlie Rose: The priority is acquisition rather than equity position? Warren Buffett: Absolutely. I hope -- we have 73 businesses now. And they go all the way from Dairy Queen and the deli bars, you know, to 737s at NetJet. So we've got a little bit of everything. But I want more of everything. I would -- you know, I hope that 73 becomes a much bigger number. I like buying stocks too, and it is a game I know to some degree. But the real goal at Berkshire is just keep building more and more earning power from operating businesses with terrific managers doing -- that means I don't have to do a damn thing. I just sit there in the office and, you know, play my ukulele or whatever. Charlie Rose: There is more than that. Warren Buffett: Well, but it is -- the truth is, if you get a good business, you know, it's the gift that keeps giving. I mean, it gets better over the years. And instead of going from flower to flower, like you do more in the stock market, you can -- if our 73 businesses we have now are very likely to be earning appreciably more money just by themselves 10 years from now, on top of that we will add more. And that's -- I love doing it, I love the managers that we associate with. And it's a lot of fun. Great article as always; thanks for sharing your expertise. Given how BRK traded after the Apple announcement, did it trigger any additional thoughts? Or is this what one should expect as responsibilities continue to grow for Ted and Todd?